More new stuff this week, including probably my favorite produce item on the planet…strawberries. Still not sick of the delicious lettuces we get each week. We never have problems eating it up, and it tastes so much better than grocery store lettuce. Definitely one of those produce items that has a taste difference when it’s fresh and local. Mark and I are also big broccoli fans, so we were happy to see this guy. I was putting the broccoli in my bag while I was picking up and a little boy standing nearby looked at me with wide eyes. Yeah, kid, it’s pretty cool. You should eat some! Green onions will supplement our stash. So far this week we’ve eaten them on salads and in a sesame tofu stir fry I made (yum). Garlic scapes are one of the cool vegetables that I discovered from being a CSA subscriber a few years ago. Scapes are the stalks of young garlic plants, and as I understand it, we get to enjoy them because they are cut off to allow the plant to not divert energy to growing more stalk. They taste like garlic (duh), but they’re mild. I might make a pasta with these because somehow in my head garlic and pasta go together. Am I the only one who thinks that? Last but not least, though certainly exciting, is the first pepper of the season. I adore peppers – all kinds – and this one looks firm and crisp. Can’t wait to eat this guy on a bed of fresh lettuce! This weekend we managed to squeeze in some time to put up 16 half pints of strawberry jam in two variants – balsamic and vanilla. This is our fourth year canning jam, and I think we’re really getting a good system down – meaning we’re more efficient and know the process well enough that we don’t spend as much time agonizing over the Ball book. Mark picked up 8 quarts of berries from Mason Farms in Erie when he was traveling for work last week. Nothing beats PA berries in June, I’m telling you. I have no idea why people buy California strawberries this time of year from grocery stores in western PA because these strawberries are almost a different fruit they’re so tasty. We use our dutch oven to make jam – it handles high temps nicely and can stand up to our stove’s power burner. This is the first batch of balsamic, which we made for the first time last year and just love. The vinegar adds the right acidity and deepens the flavor of the strawberries. Mark was the jar filler. He often does this step, probably because he’s tall enough to more easily reach into the pots. We’re going to need to replace our canning rack soon because it’s starting to rust out. Four years of use is probably more than we can ask of the thing, being pretty cheap in the first place. We didn’t think the vanilla flavor was incredibly pronounced in the finished product, but it was subtle and quite tasty. Maybe if we make this again next year we’ll amp up the vanilla factor. I love seeing our dining room table fill up with canning jars on towels. Means it’s really summer and we’re going to start stocking our canning cabinet again! The rest of the 4 quarts of strawberries that didn’t go into jam were made into strawberry shortcake topping and cut into pieces for snacking (and enjoying straight up). We’ll be getting another quart in our CSA this week, but honestly I can’t get enough strawberries in the summer. The joy of having them for a short season makes me want to eat as many as possible while they’re around – and do things like can jam to save some for later! 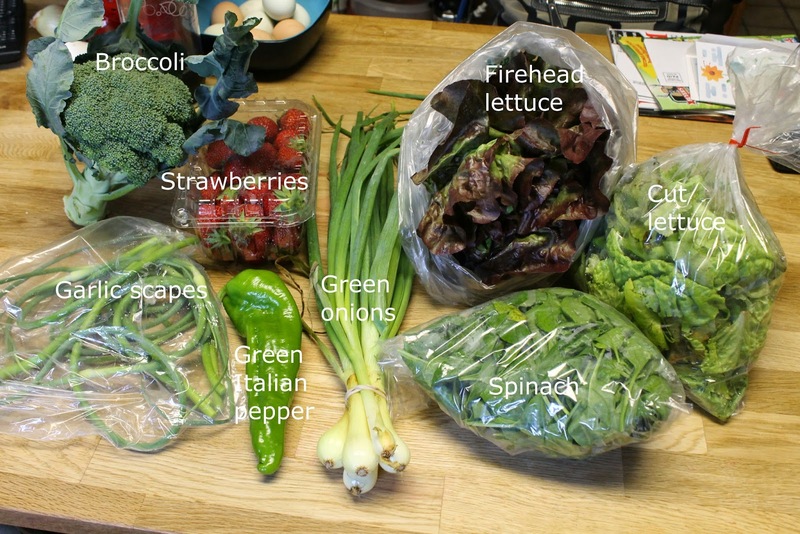 I can’t believe we’re already on our fourth week of our produce CSA from Kretschmann’s. I feel like each week it’s getting better and better (which is the way it goes in the summer!). Here’s what we have this week (plus some random stuff on my kitchen island I was too lazy to move (frozen yogurt, eggs and some Ball spice jars, which are amazing). 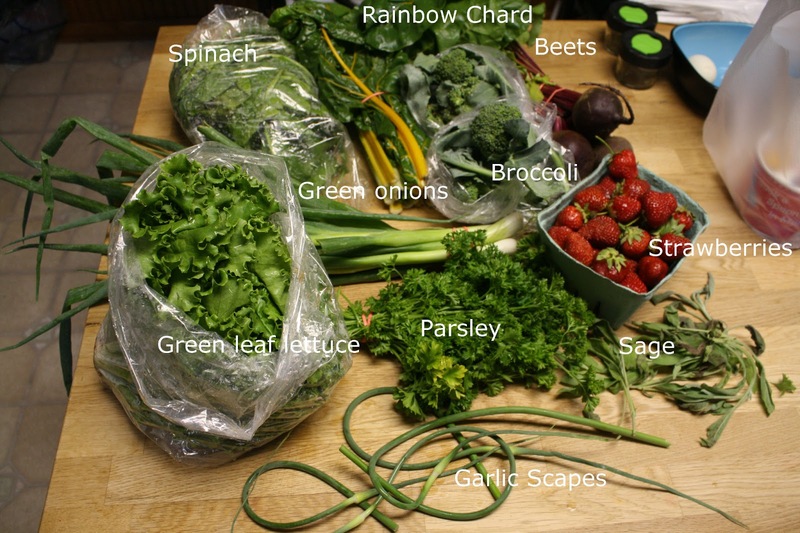 I am really happy to see the rainbow chard – I squealed when I pulled it out of the bag. It is absolutely gorgeous. It sounds hokey, but the colors of nature always get me. The yellow is so vibrant. Beets are not really my bag. Haven’t found a preparation yet that I can stomach, though I’ve been told my grandma’s Harvard Beets were pretty amazing. Thankfully Mark has a co-worker who loves beets, so off to work they went this morning. They certainly are lovely looking, though, especially the greens. Then we have berries again, which is bittersweet because I know the season will be winding down soon. Thankfully we got an email this week that one of our favorite orchards that goes to our farmers market now has blueberries! Another fun addition this week are the garlic scapes. Garlic scapes are the curly tops from the garlic plant, and you can eat them! Here’s a link to some ways to use garlic scapes if you’ve never cooked with them before. Counting down the days until the first tomato and the first pepper. I think I’m so excited for tomatoes I might lift it up to the heavens when I get that first one and offer prayers of thanksgiving! Coming up next week, more garden updates after the storms we’ve had this past week, information about new studies on GMOs, and the influence of industrial agriculture and corporate food on the healthcare industry. 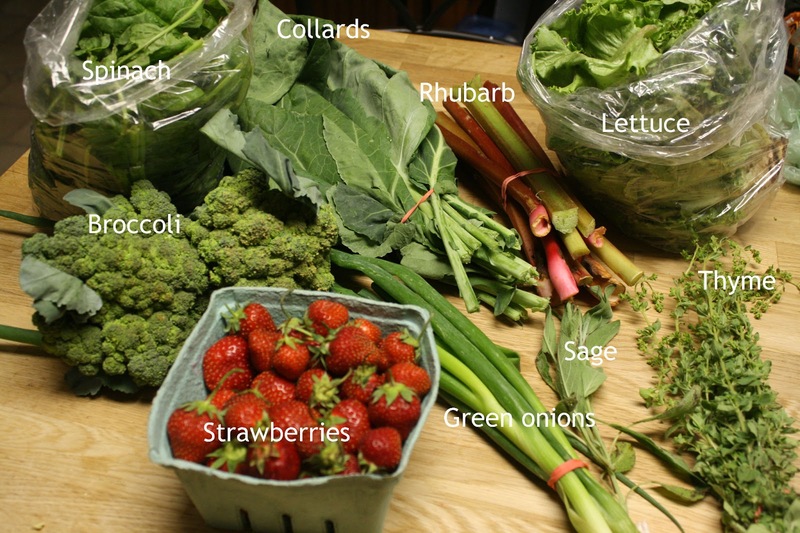 Third week of our produce CSA from Kretschmann’s. More berries, a new herb new greens and broccoli! We’re going to combine the rhubarb from last week with this week’s to make a crumble, most likely this one. Berries are already in our lunches. Lettuce and spinach will make great salads and we can use extra spinach and broccoli in side dishes. Green onions are great on salads, or in the dish I made last night with ground pork from Clarion River – dan dan noodles. These collard greens will become soul food, probably with some bacon. For people who are not familiar with different types of greens, this visual guide is great. Thyme and sage will be dried out, as we’re starting to get a large stash of fresh. Last but never least, the extra purchase this week: a flat of strawberries. You know what that means…it’s jam time. It’s berry season in western Pennsylvania, and I’ve made no secret of my abiding love for strawberries. My grandparents live in northwestern Pa. and they have grown berries every year since I can remember. Some years aren’t so great – late frost took them all last year. But this year. Finally. Berries galore. Mark was helping my grandpa with some work around the house Saturday and came home with a quart of fresh picked berries, straight out of their garden. And you know what that means. It’s shortcake time. My grandma has also made this shortcake as long as I can remember, and it’s everyone’s favorite dessert. We even have a running joke in the family that you’re only a true member if you eat your shortcake with just strawberries. The outsiders always want to add some sort of cream or cool whip monstrosity to it. This recipe is different from your standard strawberry shortcake because it bears no resemblance to a cake, angel food or otherwise. It’s more like a cross between a biscuit and a shortbread. Here comes the fun part. Just mash it all together and plop it on a tray. It’s really that simple. Mash them like potatoes and add any sugar. Go easy though – ripe summer berries are already quite sweet. Once it’s baked, cut it into chunks. Put it in a bowl like a normal person (left) or in a giant bowl of whipped cream like a crazy person (right). You can guess which one was mine. Top with berries while the shortcake is hot. This is dinner and dessert wrapped up in one. I’ve made this for a lot of people over the years and not once has anyone had anything but praise for it. It’s truly one of those magical desserts that pleases every crowd. Email me at nextgenhouse at gmail dot com or send me a DM on Twitter if you’d like the recipe!